As you spend time along your path you begin to acquire treasures. 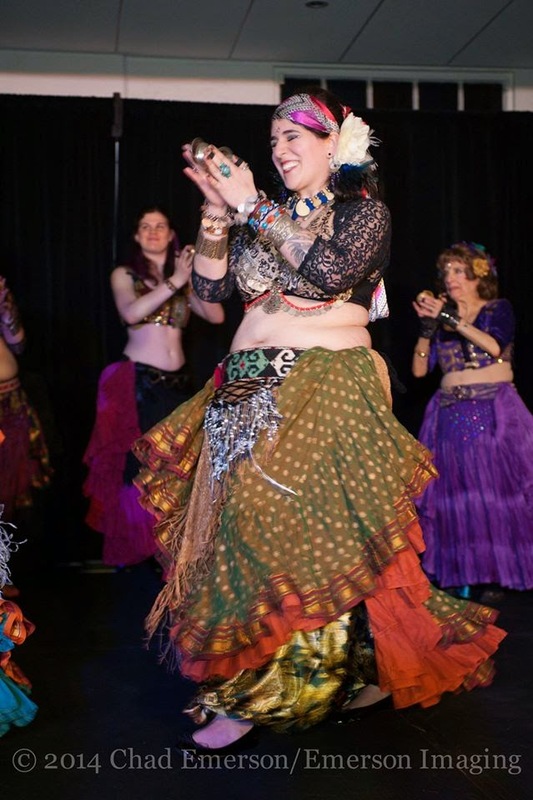 Part of the fun of being a tribal belly dancer is all of the costuming options you have. There are full skirts of different patterns, different textured tops, and so many colors to choose from. And don’t forget all the sparkly decorations for our hips and hair! Each dancer’s style and wardrobe speak a bit to their spirit, helping to create a unique look for stage. I want show you the various types of the treasures and help you feel confident in picking those bold pieces. I hope this inspires you to be free to create your style. 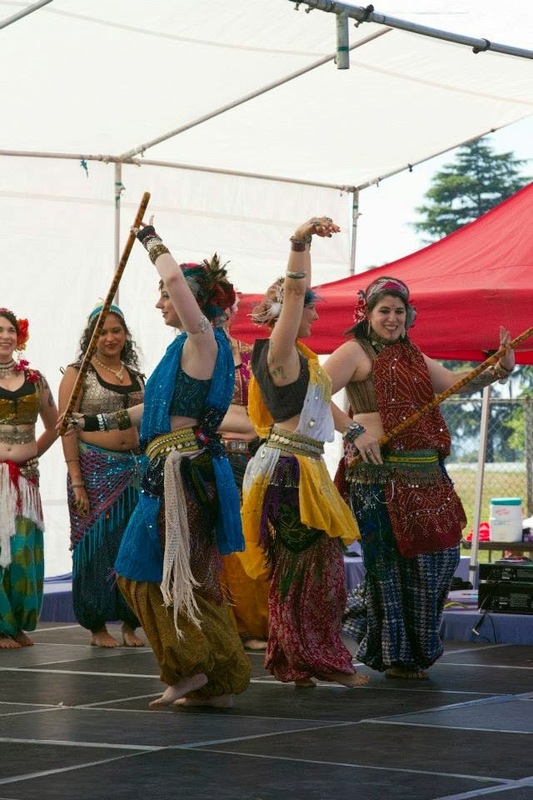 Tribal’s aesthetic is borrowed by the cultures that influence this dance. We adorn our hair with flowers as do the flamenco dancers. However we do not wear just one, two or three flowers – you can have a whole garden on your head! Flowers are not your only option, either. You can find beautiful coined head dresses or be crafty with old kuchi (colorful glass/beaded) earrings. We wrap our hair with scarves – when Fat Chance began they would typically wear turbans. Carolena Nerricio-Bohlman has said she loved turbans as they helped her feel taller. Hair falls and rats are common things used to help add hair and texture to your crown. I like to think of my hair as creating volume, so don’t be shy with those decorations! As long as you use equal amounts and volume in each aspect of your costuming, your overall look will be balanced. With these tops we also wear decorated bras, either over or under, depending on the style you have chosen. If you are savvy with thread and a needle, you can find patterns to create your own tops or style your own bras. When it comes to decorating a bra, you can use an old one you have or buy a plain base to embellish, or purchase a D.I.Y. kit from online dance stores. You can use any fabric to cover the bra and use coins, beads or shells to decorate your top. There is no right or wrong way to do it–one thing that I love oh so much when creating pieces. If you are unsure where to start, there are plenty of tutorials online to help get you going! On the bottom, in ATS© we typically wear full and fluffy skirts that make our hips look even more beautiful. You typically see the full 25 yard skirt but there are also 10-15 yard skirts that are great to layer on top of the fuller skirts. On top of our skirts we wear hip scarves and belts. These hip decorations help showcase our movement and enhance even the most subtle shimmy. I think of my hip scarves as a way to add texture to my overall look. For example, crocheted sequin scarves are my favorites to help add a little interest around my other scarves. Look to Silk Road Tribal for these wonderful treasures. There are tassel and fringed belts that add tremendous texture to the overall look. Some of the best places to find hip scarves are either import or thrift stores. Explore and don’t be afraid to try something new and different! 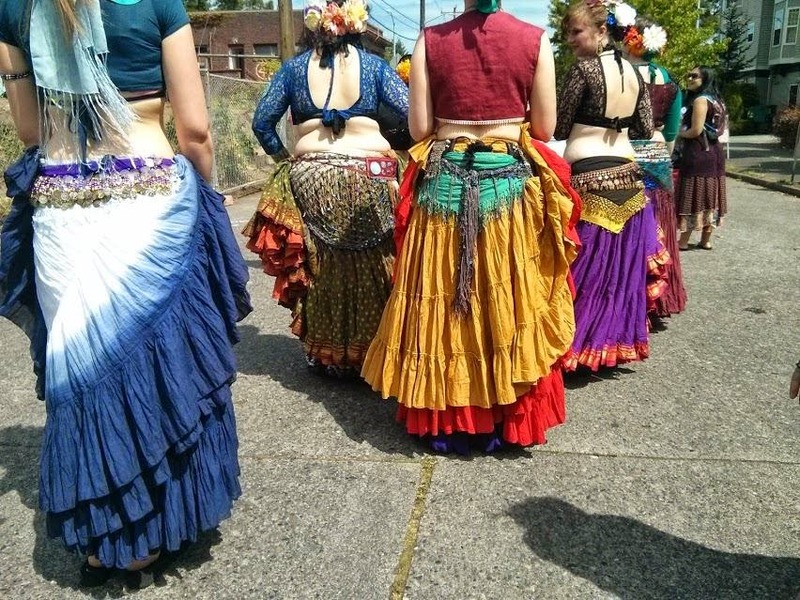 Because we also like to maintain our modesty, we wear pantaloons (aka “harem pants”) underneath the skirts. These are made in a range of fabrics typically in the cotton or silk family. Careful of using too light or too thick a fabric – too light and it will puddle at the bottom and too thick will have no movement. I typically wear patterned pantaloons to create contrast and texture in my costume, picking colors which complement the other pieces in my ensemble. Skirts and pantaloons are typically free-sized, able to fit a wide range of body types. Most have the elastic or drawstrings, so you simply adjust as needed. However there are some size-specific pantaloons so make sure to check before buying! Note that pantaloons are one costume piece that you are able to make easily at home. Trust me, I am one who does not have a lot of sewing skills and I can now make pantaloons in a day. All these elements means there are countless options when it comes to combing colors and patterns. One of the hardest decisions you’ll have to make when wearing your skirt(s) is how you want to tuck it. 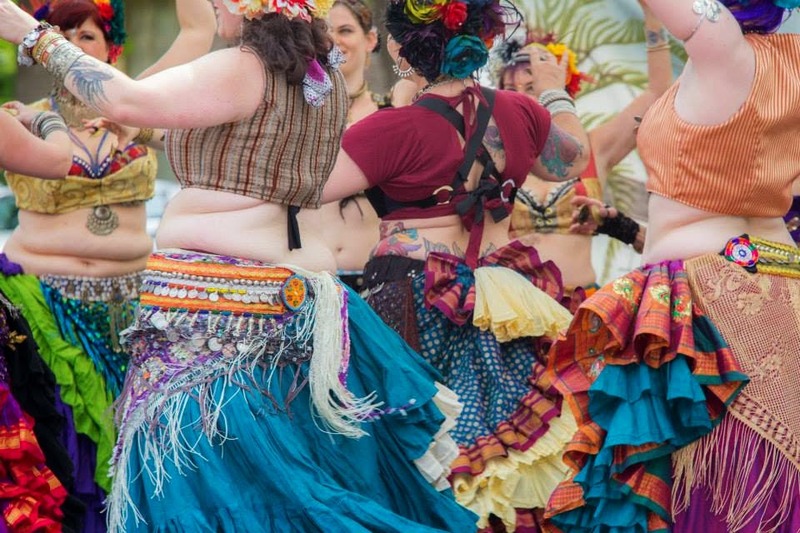 You will see most tribal dancers tuck their skirt in artful ways, which is both beautiful and practical–it ensures you won’t trip on all that fabric. Make sure your skirts are tied nice and tight – this will help the tucks not fall out as you shimmy and shake on the stage or in the classroom. There are various resources online with tutorials on how to tuck, or you can ask your teacher or fellow dancers for suggestions on how to do beautiful and creative tucks. As overwhelming as it may seem to start finding your treasures, you only need one or two options in each area. For years I was only able to create a couple looks from my costuming. I recommend attending local dance festivals so you’re able to physically see all the beautiful sparkles. Ask your dance family where they purchase their items for good spots, too. 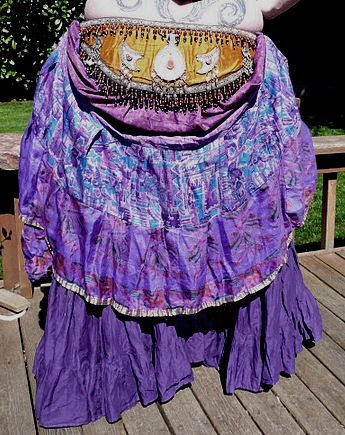 My favorite online shops are Magical Fashions, Flying Skirts and Tribe Nawaar. All make great quality items and are timely with their deliveries. If you want something a little more personal, I love my Painted Lady vest. You are able to choose fabrics, styles, and fastenings for your pieces. Remember custom pieces can take time so make sure you don’t wait to the last minute to get your order in. I hope this has helped you know what to look our for on your path. Don’t be afraid to try a new color or pattern that isn’t typical of you. You could find a new part of yourself you didn’t know! Go out and barter and gather those new trinkets and treasures. Tribal Crafternoon Workshops in December!